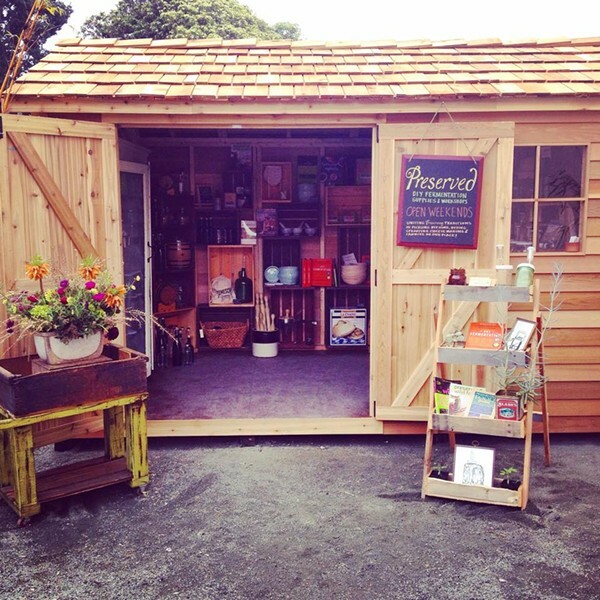 Preserved is a pop-up shop located in a backyard garden shed (via Facebook). The latest Oakland pop-up shop is located in an 8-by-12-foot garden shed located in the backyard of the home decor store Neighbor (4200 Piedmont Ave.). The pop-up, which owner Elizabeth Vecchiarelli has dubbed Preserved, looks to tap into the Bay Area foodie community’s resurgent interest in old-fashioned methods of food preservation. While it’s hard to throw a stick in Oakland these days without hitting some restaurant or shop that touts its inventory of artisanal pickles, Preserved takes more of a do-it-yourself approach to the topic. In other words, instead of selling pickles, Vecchiarelli will sell you all of the supplies you need in order to make your own pickles. She explained that the shop is meant to meet the needs of urban homesteading experts and novices — the latter of whom may want to check out the sauerkraut or kombucha “starter kits,” which come with air-locked jars, recipes, and other basic supplies. And for aspiring bakers, Vecchiarelli sells three different sourdough starters: a traditional one, one with whole wheat flour, and a gluten-free version that’s made with brown rice flour. Vecchiarelli, who most recently worked as a server at restaurants such as Camino and Homestead, said her interest in food preservation stems back to her twenties, when she did a stint at Philadelphia’s Tria, a wine bar dedicated to educating customers about the “fermentation trio” of wine, cheese, and beer. She also has experience in making natural wines (with Oregon’s Teutonic Wine Company), unpasteurized cheeses, and herbal medicines. Since Preserved has limited visibility due to its lack of a traditional storefront, Vecchiarelli is rolling out her business slowly, with just limited hours to start. For now the pop-up is Saturdays and Sundays only, from noon to 6 p.m., but if all goes well, Preserved will be open six days a week by May.